You can almost convince yourself it's a healthy pie. After all, fiber-rich apples, antioxidant-laden cranberries and cholesterol-fighting oatmeal can create a miracle dessert, but really, who are we kidding? The truth is we had a huge over-supply of cranberries so Todd decided to improvise on an apple pie recipe from Bon Apetit. The cranberries give the filling a pretty color and a little kick from their inherent tartness. This balances off the streusel really well. And for your reference, the Costco bags of cranberries are SIGNFICANTLY larger than the grocery store bags. We may be adding a bunch of cranberry recipes soon! Pre-heat oven to 400 degrees. Toss all the apples, cranberries and spices in a bowl and let them sit in a bowl. Lightly flour whatever very clean and dry surface you are working on (We have a pastry board). Roll out the pie crust dough to 9-inches, round. Sprinkle the oats over the crust and roll it into the crust. Put the crust in the pie pan, oats on outside, and press into the dish. Mix everything except butter and oats together and toss it into a food processor. Add butter and pulse in fits and starts until you get something that is the consistency of damp sand. Add oats and mix, but only a bit more, keeping about half of the oats whole. 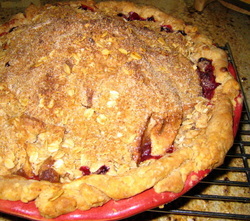 Give the apple cranberry filling a final mix and dump it into the pie crust. Make a mound in the middle. Sprinkle streusel over. Bake until golden brown, about 40 minutes and then reduce temperature to 350 and cook about an hour more, until the apples are soft. Cover the top with foil if you need to so that the top doesn't get too brown. Serve warm with whipped cream or vanilla ice cream. If it's Thanksgiving, eat before the pecan pie.